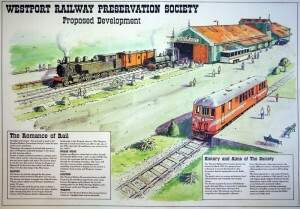 Nostalgia and tourism – they go hand in hand in the Westport Railway Preservation Society’s vision for part of the town’s waterfront – Experience the romance of rail and help preserve a piece of Westport’s industrial heritage – is the theme for this museum railway. Picture a couple of steam locomotives, carriages and a 1930s railcar and the vision becomes clearer. And not just any steam engines and railcar. The society hopes to run ones that used to belongto Westport in those busy days when Coal, Rail and Ships were the three kings of the West Coast. The Society has already salvaged the first steam locomotive which worked in Westport 125 years ago. The Society now hopes to acquire one of the 48-seater Vulcan railcars which served Westport faithfully for nearly 30 years. Further down the track the group want to obtain a WW class locomotive which used to be such a familiar sight carrying long rake of coal wagons from the bottom of the Denniston Incline, Ngakawau and Seddonville to the Westport wharves. (The Westport Borough Council turned down an offer to take one of the WWs when the old workhorses were retired in the late 1960s). Imagine traveling in a steam train or railcar through the beautiful Buller Gorge ~ and a northern Buller trip between the mountain and the sea to Ngakawau through the old mining townships. This vision will take time, money, energy, commitment and a sprinkling of good luck to happen, but the society is optimistic about its plan and Westport’s tourism future. The Westport Railway Preservation Society is ideally located on the waterfront opposite the town centre between Brougham and Lyndhurst Sts. It is the starting point for the Buller Heritage Highway and a main feature on the new Westport walkway.